Take a moment to consider this: the majority of the world’s population is your age group (16 – 26) and there is also a high concentration of mobile internet use (see the GSMA 2015 report). Brck is a social entrepreneurship based in Nairobi, Kenya. One of their projects is to bring tablets to classrooms for learning. Their motto is “We do hard things”. Here in Doha at Reach out to Asia Empower 2016, I encourage the audience to also consider how we can have social impact aimed at the Sustainable Development Goals. This means focusing on an issue or topic that inspires you. Your power is your curiousity. All around the world there are people creating social innovations and social entrepreneurship projects/businesses. This is your learning space – wide and full of potential. Who is doing a similar topic in a region that you could remix in your area? What tools and tactics are they using? What are some of the gaps and opportunities in your area? In the social entrepreneur space, if you do your homework there are many people who will answer questions and support you. We all have a common mission to do some good. Once you have an idea, then consider implementation in small, medium and large ways. Pardon me, if this already exists, but one regular activity that think could be an outcome from Empower 2016 is to consider how to keep in touch with each other. Your power is with each other. Have you set up a WhatsApp group for the the topic that inspires you? Can you host a regular meetup (majlis) for coffee (karak) to brainstorm and co-create? Many of you mind wonder what is Qatar Computing Research Institute doing for social entrepreneurship. We are a resource for this region. Staff have widespread experience in social computing research and technologies plus we are part of the local entrepreneur ecosystem. Some recent research examples include: climate change (sentiment in Qatar), what your apps say about you, and aerial imagery for disasters/environmental action. What does this mean for social entrepreneurs? Well, my former colleague Patrick Meier has set up a business with other experts called We Robotics. This group aims to use new technology for good with field training and big data analysis. One of the first projects they explored was with a university in Nepal. They will collaborate with FlyLabs around the world. The Humanitarian OpenStreetMap Team together with partners like Ramani Huria combining maps, urban planning and student power to make a difference in Dar es Salaam. Students and youth are instrumental in these projects. Combining digital and in person programmes, research can be a guiding force to help you review ideas, prototype and consider critical lessons for success. It is true, I am often bias to technology solutions since this is my passion and field of expertise. However, I encourage you to create first without technology – nothing replaces the power of in person conversations, pen and paper. In today’s workshop, we will consider digital skills for good and how it can apply to your social entrepreneur efforts. 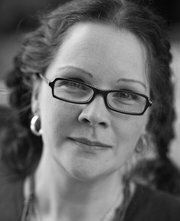 Data is core to excellent storytelling and convincing programmes or businesses. 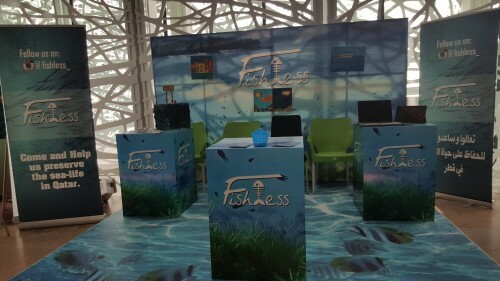 Let’s take Fishless, for example, they are using art and design to convey a message: We are creating a world that will soon be fishless. What is the data behind that? In Canada, there is a ban on fishing cod in the Atlantic. This government policy was instituted after scientists and activists did the math. The fishery industry and many communities changed for this new reality. It is hard to consider a world with out fish. What are the data sources available in Qatar, for example, on fish resources. Another group here at Reach out to Asia is #QatarDugongs. This club aims to protect the dugongs. Their campaign to raise awareness is important. The partnership is fantastic. 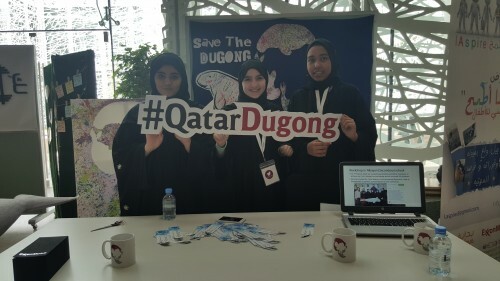 Students from Albayan Secondary School have a club #QatarDugongs. The partnership of Qatar University, Texas A & M and Exxon Mobil are working on a youth outreach program while conducting a dugong census project. This research data and community support will be invaluable for Qatar to meet goal 14 – Life below Water.